The Prince yearns for love. 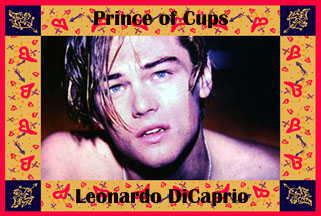 The Prince of Cups is the gallant and tortured romantic lover. A kind, loving humanitarian, overly emotional, this person can soar at the height of love's ecstasies in joy at a tender kiss, or fall into an abyss of heartache from one of love's cruel misunderstandings. Sad Leonardo was torn away from Leonardo DiCaprio, vu par Robin.